Epileptic seizures are caused by excessive electrical activity within networks of neurons in the brain. This electrical activity is generated by the flow of charged particles called ions into/out of the surface of the neurons. Ions enter and leave neurons via structures known as ion channels (figure 1), and once the current within the neuron reaches a certain level it “fires”, and a signal known as an action potential travels down its long arm (axon) to an axon terminal(figure 2). 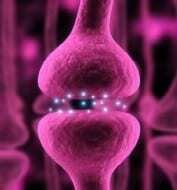 At the axon terminals are synapses. Synapses are essentially very narrow gaps between an axon terminal of one neuron and the beginning (dendrite – figure 2) of another neuron, across which signals are transported. Signals do not cross synapses in an electrical form, but rather a chemical called a neurotransmitter is released from the end of the neuron, and this carries the information across the synapse in a chemical from. The dendrite of the next neuron (the receiving neuron) has receptors for the neurotransmitter on its surface, and once the neurotransmitter binds to these receptors (figure 3), the signal can continue its journey in an electrical form along the axon of the receiving neuron. Neurotransmitters are either excitatory or inhibitory, meaning that the receiving neuron will be either be stimulated to fire or silenced. The main excitatory neurotransmitter in the brain is called glutamate, and neurons that release glutamate are called excitatory neurons. The major inhibitory neurotransmitter in the brain is called GABA and neurons that release GABA are called inhibitory neurons. A fine balance between excitation and inhibition must be maintained in order for the brain to function normally. 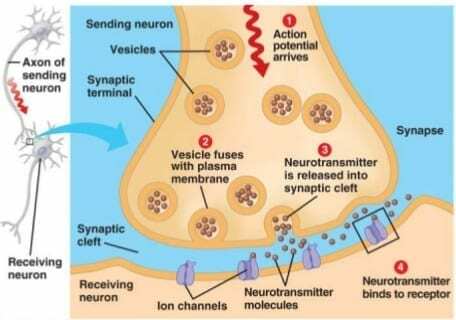 If there is too much glutamate, neurons can become hyperexcitable and a seizure may result. Neurons can also become hyperexcitable if there is too little GABA released at the pre-synaptic membrane, or if its receptors are not functioning properly, this can also make corresponding neurons hyperactive and susceptible to seizures.